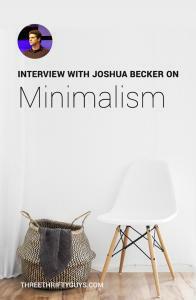 The following was first published several years ago, but thought we would combine the two interviews that took place with Charlie and Joshua on minimalism. Enjoy. Last week our church had a speaker come in for a Tuesday night special on “Doubling Your Impact.” I got word from one of our friends that the speaker was Joshua Becker (from becomingminimalist.com). He was speaking on the topic of minimalism. I thought it sounded interesting, and I’ve written about this topic before on TTG. So I lined up an interview with Mr. Becker, because I wanted to know more and I thought our readers could get a lot out of it too. Here is the first part of my interview with him. 1 Tell us some interesting facts about Joshua Becker? 2 What was the main thing your neighbor said that moved you to become a minimalist? 3 Why did you say to her, “The more stuff you own the more your stuff owns you”? 4 Was becoming a minimalist hard for you? 5 Are there any books that really influenced you in becoming a minimalist? 6 What is one area where you think most Americans can do without or less of? 7 I recently read your post on, having a smaller home (12 Reasons Why You’ll Be Happier in a Smaller Home) and wondered – since becoming a minimalist have you changed your housing lifestyle? 8 Do you think technology can help or hurt us in becoming a minimalist? 9 What has been the hardest possession you had to get rid of? 10 Did you get rid of everything? 11 Do you think being a minimalist is biblical? Why or why not? 12 Do you think you can ever be “completed” or done as being a minimalist? 13 I’ve noticed a lot of folks from the great depression are “hoarders”. Why do you think that is? 14 If we go through another great depression or severe recession do you think it will be good to be a minimalist? Why or why not? 15 Is being a minimalist hard with kids? 16 What do your kids think of your lifestyle – has it been hard for them? 17 How do you do birthdays and Christmas now that you’ve become a minimalist? 18 If I want to start becoming a minimalist how do I get started? Tell us some interesting facts about Joshua Becker? I am Midwest guy born and raised who now lives in New England. I have a twin brother. My son is 8 and daughter is 4. I’m a big sports fan. I’m a Minnesota twins fan and I hate the Yankees. I cheer for the Red Sox only because I hate the Yankees. What was the main thing your neighbor said that moved you to become a minimalist? Why did you say to her, “The more stuff you own the more your stuff owns you”? It was a phrase I used growing up, but I never realized the full truth of that quote. It wasn’t until I started getting rid of stuff that I realized how much it owns me. Was becoming a minimalist hard for you? Ya and I would even say I’m still becoming a minimalist and I’m still in the process. We got rid of 60-70% of our stuff, but I feel there is still more to get rid of. I think its a long process and more emotional than people think. Are there any books that really influenced you in becoming a minimalist? I read two blog posts and one book. “Clear your clutter with feng shui” by Karen Kingston – got it at Barnes and Noble. She got into the causes and reasons people collect clutter. Emotional attachment or insecurity. They know how much it costs, so they can’t get rid of it. What is one area where you think most Americans can do without or less of? Everything. Clothes, toys, decorations, kitchen gadgets, linens. I would say if people went with less television, then they’d struggle less with other things. They’re selling you the lie that: More is better. I recently read your post on, having a smaller home (12 Reasons Why You’ll Be Happier in a Smaller Home) and wondered – since becoming a minimalist have you changed your housing lifestyle? No. There is two things…I want to go down to one car and smaller home. It’s the stress of having to do it that stops me. I don’t want to sell ours and go find a new one. Logistically I can’t see how it would work. Do you think technology can help or hurt us in becoming a minimalist? Both. I think we are in a great period of time where technology can limit the amount of stuff we own. In addition, I think there comes a point where technology becomes burdensome. Overall though I think it is more beneficial than hurtful. What has been the hardest possession you had to get rid of? The hardest one had to be the sentimental stuff. Particularly it was my childhood stuff that has a lot of memories tied to those things. Did you get rid of everything? I didn’t get rid of all of it, but hung onto 7 or so things that really meant a lot to me. 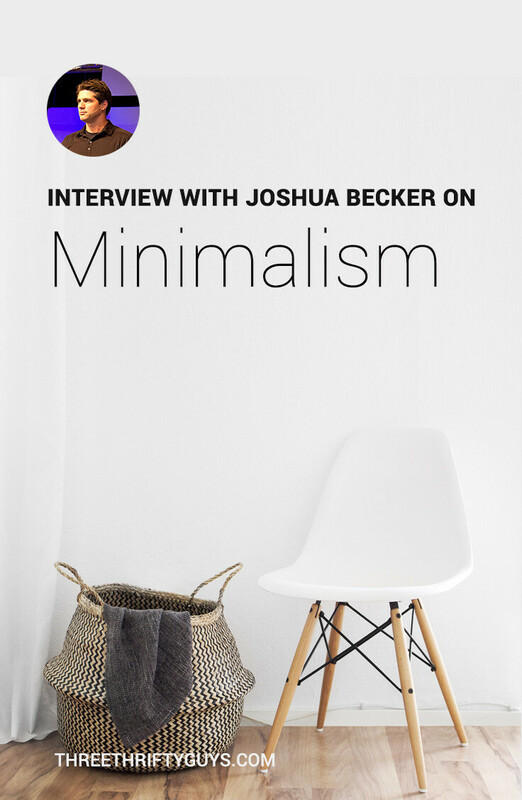 Do you think being a minimalist is biblical? Why or why not? Ya I think it totally is. I think Jesus taught we should live a minimalist lifestyle. Sell your possessions and give to the poor he said. He lived a minimalist lifestyle and taught it. I totally see his teachings now as a better way to live. Do you think you can ever be “completed” or done as being a minimalist? My guess is no. I think its always an ongoing process. We are always evaluating if we need it. I’ve noticed a lot of folks from the great depression are “hoarders”. Why do you think that is? I think that they have “just in case thinking.” A lot of people hold on to things with an insecurity. There is more of a tendency from this generation to hoard because of the possibility that it could happen again. If we go through another great depression or severe recession do you think it will be good to be a minimalist? Why or why not? I think so, it’s a much easier transition to go from more to less by your own decision. I think it’s when people are forced to live with less then it can be tougher. Is being a minimalist hard with kids? Yes. It requires you to be more intentional and more strategic. Children make it tougher to be a minimalist, but it makes it more important. What do your kids think of your lifestyle – has it been hard for them? It depends on their temperament. It goes easier for my son than my daughter. She has a personality that she wants as many barbies and dress up clothes. How do you do birthdays and Christmas now that you’ve become a minimalist? We still give gifts to our kids, however, we have started buying things that we know that they need. Also we stopped buying 6 or 7 toys and only started buying one or two. We have not told the grandparents to not get us toys. They are slowly catching on. We make extra effort after birthdays and Christmas to clear out the old toys. If I want to start becoming a minimalist how do I get started? First I think that you need to be convinced on why it’s better. Then start small. Pick one drawer. Pick one room. Then go room by room. Just get started and you’ll see how freeing it is. I publicly wanted to thank Joshua for meeting with me for this interview and the impact this interview and his speech had on me and my family. My wife and I have already started on decluttering our home, and like Joshua says: it’s freeing. I particularly like his last answer on how to get started. “start small. Pick one drawer.” We often think change in our lives has to come as a large sweeping change. However, when we break it down to just one drawer then it feels more manageable, and something that anyone can accomplish. Once you complete just one drawer you realize that it is freeing. It’s hard to explain, but just try it. Start with a drawer today!